Continuing professional development (CPD) is a continual process of lifelong learning which is focused on implementing learning in your professional practice and improving outcomes for patients. 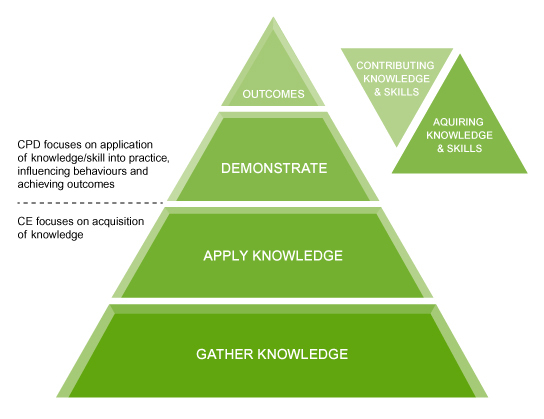 It is more than simply the acquisition of knowledge and skill; the emphasis is on influencing the behaviours expected of a competent pharmacist as identified in the Core Competency Framework - see under Professional Competence. It differs from continuing education (CE) in that it is not based on a traditional points system or accumulation of contact hours. It represents a more flexible approach to learning and recognising a wide variety of learning activities from formal learning to on-the-job learning. It is a self-directed learning process based on a 5-stage CPD cycle which includes: self-appraisal; planning; action; documentation and evaluation. It involves reflective practice with pharmacists required to reflect on individual experience to identify learnings or how they might need to improve their knowledge, skills, behaviours or attitudes (i.e. competence). It is a structured process which requires recording and reflection at all stages of the CPD cycle e.g. recording of learning needs, documentation and evaluation of learning outcomes, identification of actions to enhance practice. "CPD is based on a model of self-directed learning and reflective practice"